You don’t want to miss anything out of your Master’s dissertation, or get anything in the wrong order, so this blog will look at what is required to be present in a good dissertation. It will outline the components, and a chapter structure for the master’s dissertation, which could also be used for an undergraduate final year project. Check with your institution to see if you can download a template to cover all of the things I am about to mention. Maybe you will only be provided with a cover page, but if your institution requires it, then use it! You may also have access to example dissertations previously submitted at your institution. These examples and templates should over-ride my comments in this blog. Learning these tips and tricks early will allow you to concentrate of writing the dissertation rather than fight with WORD! The Cover Page with approved institution logo. This will be without any page numbers, but will include the title, student name, and ID number. This is the first thing that people will look at in your dissertation, so get it right! Make sure that your supervisor is happy with this structure and sequence, but I believe it to be correct and comprehensive. I have linked these to blogs I have written on each topic as appropriate. You can change these chapters slightly. I have seen a literature review in two separate chapters covering different essential knowledge, and two or three case studies may each own a separate chapter. Taken together, these four sections should be everything that you would expect to find in a Master’s Dissertation. Learning how to use WORD properly greatly assists the development of the dissertation. 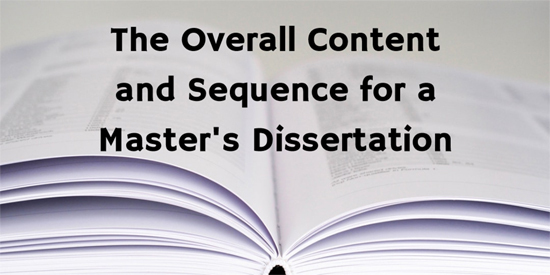 Ensure that you have all the relevant sections and content for a comprehensive dissertation.